Emergency personnel from around Western North Carolina travel to Macon County to conduct training at Southwestern Community College Public Safety Department’s burn building. The state mandated training requirements help fire departments and emergency personnel in the region prepare for different scenarios they may face. The current burn building has been in operation since 1990 and serves fire departments from around the region. Both a Southwestern Community College engineer and independent structural engineer Martin Phillips, who was hired by Macon County, recommend that the current building be completely replaced within the next 12 to 18 months. Earlier this year, SCC presented commissioners with an engineering report that recommended replacing the building to the tune of nearly $2 million. With so much money being possibility invested in the project, Macon County commissioners voted to get a second opinion on the building, which resulted in the same recommendation — replace the entire facility. “Local emergency personnel use the building for both live burn training and for other non-burn related training such as smoke training, ladder training, hose training, and rescue training,” explained Macon County Emergency Management Director Warren Cabe. According to Cabe, a burn building isn’t the only way emergency personnel can receive the training they need. “Live burn training can also be conducted in certain buildings scheduled for demolition, after a proper inspection is completed of the facility for safety purposes. Facilities similar to SCC’s burn building are also available in other counties such as Buncombe County and McDowell County that can also be used for approved live burn training,” said Cabe. SCC Board of Trustees has voted to place the burn building replacement on the priority list to receive funding from the Connect N.C. Bond, which was passed by referendum earlier this year in a statewide vote. Revenue from the bond can cover 100 percent of renovation projects, but counties are required to pay a portion of new construction projects. SCC estimates replacing the burn building would cost $1.9 million of the bond revenue with Macon County being required to contribute another $475,000. The burn building, which is located in the Industrial Park, is a three-story pre-cast concrete and masonry brick structure supported by a slab on grade concrete foundation. It was built 26 years ago and is frequently used in firefighter training. In an attempt to potentially save taxpayer dollars, Macon leaders wanted the engineer to review whether the existing building could be renovated, rather than completely rebuilt. The engineering firm reported that it could not propose or recommend a repair with any degree of engineering certainty to extend the building’s life by 10 years. “The building is subject to harsh conditions that will result in further deterioration of the masonry brick walls and recast concrete panels. CSE is doubtful any proposed remedial work would extend the service life for an additional 10 years,” the report said. Not only did the engineering firm give the existing facility a little more than a year on its current life span, they also recommended that live burns be limited to the two rooms currently being used on the first and third floor. Commissioner Ronnie Beale noted his concern with how frequently the building is used by agencies outside of Macon County. 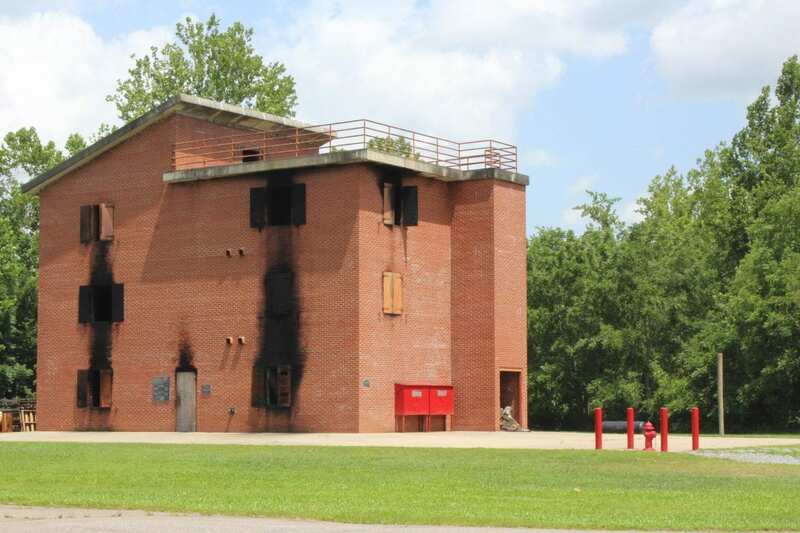 While Macon County would be responsible for the $475,000 match required to rebuild the facility, outside agencies using the building for training make up the majority of those who use the facility. “Basically, we are going to have to pay the bill for this, and fire departments from six or seven counties come to use it for free,” said Beale. According SCC’s Dean of Public Safety Curtis Dowdle, by state statute, Macon County cannot charge a fee for outside agencies to utilize the facility. While SCC has identified a burn building as a priority, nothing in place mandates such a building. The community college’s fire training program does rely on it for the required course work. Cabe and Macon County Manager Derek Roland have been working together to figure out the county’s next move.